As you take your final steps in preparing to take the Bilingual Education Supplemental (164) exam that’s part of the Texas Examinations of Educator StandardsTM (TExESTM) Program, we’ve developed this resource for you. You’ll get details about test registration, payment, content areas that will be covered during the test, plus passing score details. The Bilingual Education Supplemental (164) exam assesses whether you have the appropriate level of skills and knowledge needed to become a beginning-level educator in Texas public schools. University Initial — Normally part of an undergraduate clinical teaching program. University Post Baccalaureate — Designed for those adults with have a bachelor’s degree or higher who desire obtaining a certification and advanced degree. Alternative Certification Program — Created for nontraditional students who have a bachelor’s degree or higher, including university course work or other professional development, plus mentoring and supervision. The cost for taking this exam is $116. Payment is due at registration. Acceptable forms of payment include a credit or debit card branded with MasterCard® or VISA®. Checks or cash are not accepted. Note: Your registration expires after 170 days. At that point, if you haven’t taken your exam, you will forfeit your exam fees. When you register online, you’ll have access to available testing locations and times. Be sure to arrive early. If you arrive late for your test, you won’t be allowed to participate, and you will give up your exam fees that you’ve paid. Test Duration: The time limit to take the Bilingual Education Supplemental (164) exam is five hours. When you arrive for your test, you’ll be required to provide two forms of current identification. Each must include your name, signature and photo. Acceptable ID forms include a current passport, a driver’s license, state ID, national ID or military ID. Your name as it appears on your IDs must also match your first and last name listed on your registration materials. If your names don’t match, you won’t be allowed to sit for the exam and you’ll forfeit your exam fees. Any portfolios, bags, knapsacks, etc. Format/Number of Questions: The test will be taken by computer and is made up of 80 selected-response questions. Domain I: Bilingual Education (100%) — Includes an assessment of several areas, including foundational bilingual education concepts, including biculturism. Also reviews knowledge in developing a positive environment for learning for students. In addition, the exam looks at the level of knowledge around processes required for first- and second-language development — along with promoting language proficiency within their first language (L1) and second language (L2). Also looks at L1 literacy assessment and development techniques. The exam will also review your understanding of L1 and L2 instruction and methods for helping students achieve success. Passing Score: A total of 240 points is required to pass the exam. Your score will be posted online within seven days of your test date. While you get ready for the test, you can take advantage of other resources through Mometrix Academy. 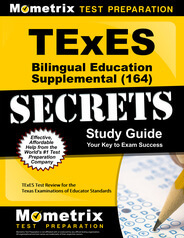 For a fee, you’ll be able to review the TExES Bilingual Education Supplemental (164) Study Guide. You’ll also be able to boost your test preparation with the Mometrix Academy set of flashcards. Mometrix Academy is a completely free resource provided by Mometrix Test Preparation. If you find benefit from our efforts here, check out our premium quality TExES Bilingual Education Supplemental study guide to take your studying to the next level. Just click the TExES Bilingual Education Supplemental study guide link below. Your purchase also helps us make even more great, free content for test-takers.